In the previous Kreia’s Conundrums, I mentioned how it’s okay to disagree. Whether it be with someone you have great respect for and look up to, or a community that you’re very attached to. It doesn’t help anyone to blindly follow anything. 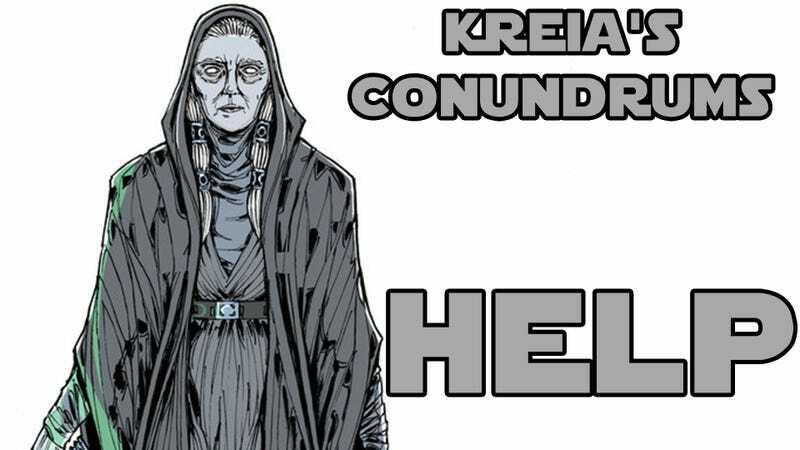 So in this Kreia’s Conundrums I disagree with Kreia on something. With that said I expressed how there are certain things about Kreia’s beliefs that I disagree with. Based on the headline you may already know what it is. Like I said before, you can learn a great deal about Kreia in just the first 10 minutes of being on Nar Shaddaa. You can encounter a man being accosted by two thugs who work for the local criminal organisation, The Exchange. You can use the force mind trick to make the thugs give you their money and commit suicide. If you do this, Kreia is infuriated, Visas will offer an opinion, this further annoys Kreia, and Kreia orders Visas to be quite, calling her a slave in the process. The entire encounter happens because the guy that’s being shaken down lies to the thugs by telling them that you have the money he owes them. While the man was in fear for his life and clearly did this out of desperation, it’s still a very scummy thing to do. He’s getting a complete stranger involved and getting them in trouble. He’s rolling the dice and hoping for the best, but now he created the possibility that these strangers may get killed alongside him. Acknowledging this is very important, because whatever happens from this point on, is all on him. While coupled with circumstantial instances out of his control, his decisions have led him to this point, and the exile is given many options to resolve the situation. In RPG’s like this, I find myself bringing certain party members along primarily because I’m interested to hear their reactions. Skills in combat tend to be secondary. I imagine this is the case with many people. With Kreia being the most compelling character in the game, I brought her along as much as I could. So how does she react to the various solution to this problem? We’ve established that force suicide does not impress her. If you help the man in any way, she ridicules you, sarcastically asking you what you think you’ve achieved. She brings up valid arguments about allowing people to fight their own battles and creating weaknesses for yourself and through your allies. But concerning the former she says that when people triumph over adversity, they will be stronger for it. There’s only one problem with that statement. It’s not ‘when’ they triumph, it’s ‘if’ they triumph. This man was about to die, or at the very least, have a couple of limbs lopped off. I believe the thugs say that he got into the debt by borrowing money. This precise situation is something he brought onto himself. He didn’t ask for help, he lied to weasel his way into getting the exile involved. If I overlook all of that for a bit, I could say that I’m not sure what I would have done, if placed in the same situation. There’s no telling what people will resort to when backed into a corner. The exile can, without using the force, persuade the exchange goons to leave the man alone for now. Considering that you didn’t have to pay a dime, and the man is still saddled with debt, in other words, his current challenge in life is still very much in place, I thought it was a pretty decent outcome. You can even take it a little bit further and pay for some of what he owes. Kreia is not pleased. I understand the value of having people fight their own battles. Something I was explaining to my brother’s wife, after she finished the main story of the Witcher 3. I’m not going to spoil anything, if you’ve already played the game, then you probably know what I mean. I also understand the value in having an appropriate amount of individualism (and collectivism) in society. If someone slips and falls into the deep end of a pool and they don’t know how to swim, but you do, are going to jump in and help them, or will you say: “He’ll be stronger for the experience.”? More likely, they’ll drown. But if you help them out, then at least they’ll be alive to then learn how to swim. Give a man a fish, feed him for a day. Teach a man to fish, feed him for a lifetime. Give him no fish or lessons, he starves. We are trying to have a society here, and in society, sometimes people need help. Kreia’s stance on this issue might help explain her reaction, or lack thereof, when it comes another choice the exile can make. The exile can suggest that the man pay for his debt as a slave. The exchange thugs agree and take him away. We know what happens to people when they are enslaved. They aren’t exactly strengthened, neither physically or mentally. Slavers don’t feed the best, just enough to keep the slaves working. Punishment for any perceived disobedience can be severe. And due to all this and more, people are broken, and the ones putting them back together are slavers. Even if he doesn’t remain a slave for the rest of his life, what kind of a person is going to come out the other end of that torture? Kreia has no reaction to this outcome, nor does she have any reaction to killing both the thugs and the man. No influence is lost or gained. In one of my videos I mentioned, and attempt to explain why, Kreia is not prone to praise, but will tell you when she thinks you’re wrong. Because of her silence in this case, the best I can do is say that she has a neutral stance on the outcome. However, she considers Visas to be a slave and when speaking to her about Visas being used as a doorway to Nihilus, she says a curious quote. If we take this phrase as being more than just using certain people, in certain instances, for specific things, then it could very well sound like Kreia is saying that any slave deserves to be enslaved because they allow themselves to be enslaved. But if they fight back against their slavers, they may very well die. Is death preferable to enslavement? I’m certain that Kreia would say that it is. Most people would say that it is. I would say that it is. But, we all know that people are afraid of dying, and have a very large capacity for hope. This all lines up with Kreia’s views on the force and why she wants it destroyed. *I wield it, but it uses us all and that is abhorrent to me. * Kreia is a slave. The force flows through all living things, thus all living things are essentially its slaves. She says that any being that gives up its will deserves its fate. Well Kreia refuses to give up her will, and she refuses to allow herself to be used by anything in any way. She would center herself to avoid that fate, and decided to find a way to put an end to it for good, for everyone. Even if it meant that she’d die trying.